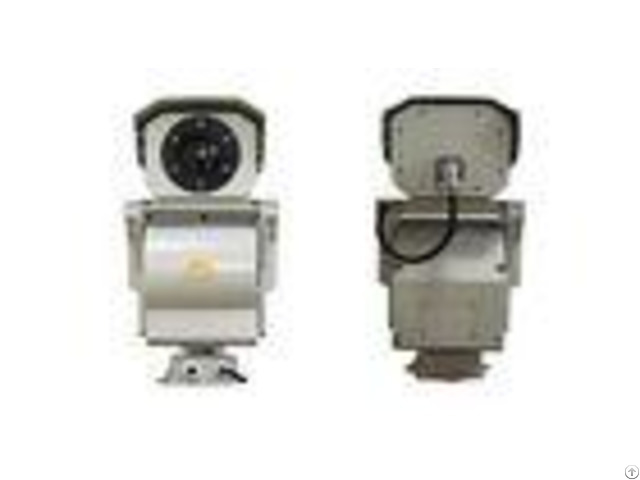 Double FOV Uncooled PTZ Thermal Imaging Camera for Long Range Surveillance Feature # # NETD 50mk enhance the imaging details even in foggy/rainy/snowy weather. # Unique AS+DOE optical design and 3CAM high-precision optomechanical design suit for both large-scale seeking and long-distance watching. # Non-uniform image correction technology, stable working temperature without TEC, good image uniformity and dynamic range. SDE digital image processing, no image noise, 10 pseudo color image and B/W switch. # Digital control PT, 360 continuously rotation observation, no dead corner, stable operation, small dithering. 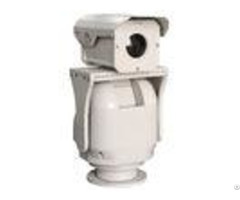 # One integral aluminum alloy housing, weatherproof IP 66, waterproof, anti-dust. Application Oilfield safety, railway&freeway security, river&airport security, forest fire prevention, city safety. 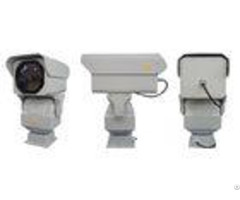 Technical specification - - - - Model | TC41021- S | TC4328- S | Detection | Vehicle: 17400m | Vehicle: 18000m | | Human: 6800m | Human: 8000m | Recognition | Vehicle: 4800m | Vehicle: 6000m | | Human: 1800m | Human: 2600m | Sensor | 1, Detector:5th generation UFPA Vox Detector ; 2, Resolution:336256, (640X512 optional) 3, NETD:50mK(@25 F1.0) 4, Spectral range:7.514m | NETD | 50mK(@25 F1.0) | Focal length | 1, Length: 21210mm 2, FOV:16121.61.2 3, Motorized zoom, focus(auto focus optional ) 4, AS+DOE advanced optical design, high infrared transmission; 5, Applied 3CAM high precision design; | 1, Length: 95/285mm 2, FOV:3.42.4/1.10.8 3, Motorized zoom, auto focus ; 4, AS+DOE advanced optical design, high infrared transmission; 5, Applied 3CAM high precision design; Dual focal fast switch ; | IFOV | 0.080.85mrad | 0.060.18mrad | Image processing | 1. stable operational temperature, starting time less than 4 seconds | 2. SDE digital image processing | 3. 10 pseudo color and B/W, B/W inverse | 4. AGC | 5. 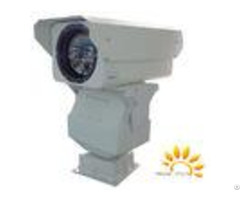 2X digital amplification | Housing | 1, Material:aluminum alloy housing, waterproof; 2, Structure:Integral single window design ; 3, Surface:PTA coating, anti sea water corrosion; 4, Sealing rate:IP66 5, Built-in temperature controller, thermal balance design; 6, Interface:aviation waterproof connector ; | PTZ(optional) | 1, Load:50kg military level digital PT ; 2, Angle:pan 0360, tilt -45+45 3, Speed:0.0130/S high precision variable speed control and locking ; 4, Preset:80 presets, support lens zoom and focus memory, variable speed scanning 030/S, support apple peel scanning function; 5, Protocol:Pelco-P, Pelco-D 6, Baud rate:2400, 4800, 9600, 19200 optional ; | Consumption, weight | 1, Consumption(PT included):min.40W, max.120W 2, weight(PT included):40kg | Interface | 1. RS-485(PELCO D protocol, baud rate 2400bps), RS-232(option) | 2. Remote OSD setting | 3. PAL/NTSC video output | 4. AC24V( DC12V option) | 5. Waterproof connector | Environment indicator | 1, Working temperature:-25+55(-40 optional) 2, Storage temperature:-35+75 3, Humidity:<90% 4, Anti-shock:0.2g(GB/T15211 20135.4 harshest level 2 standard) 5, Anti-resistance:15g(GB/T1 521120135.3 harshest level 3 standard) 6, Anti-lightening:power 4000V, signal 2000V 7, Anti salty:PH6.57.2, continuous sprarying 48 hours ; 8, Protection rate:IP66 | - - - - * The detection distance is related to the object and environmentetc. Please contact with us for further information.